Located in the heart of the Outer Banks, Kill Devil Hills is packed with fun activities for the entire family! Plus, if you can't find what you're looking for in Kill Devil Hills, it is likely only a 5 minute drive away in one of the other Outer Banks towns. Kill Devil Hills' central location makes it an ideal "home base" for vacationers who want to take advantage of Outer Banks attractions , shopping and activities. It is no surprise that fishing and water sports are popular in Kill Devil Hills. Many folks also enjoy trying their luck at crabbing. But of course, Kill Devil Hills' beaches are always the main attraction. Once you work up an appetite in the sun, you have endless options for satisfying your tummy. Home to everything from fast food joints to high-end steakhouses, Kill Devil Hills restaurants offer something for everyone. Need a break from the beach? 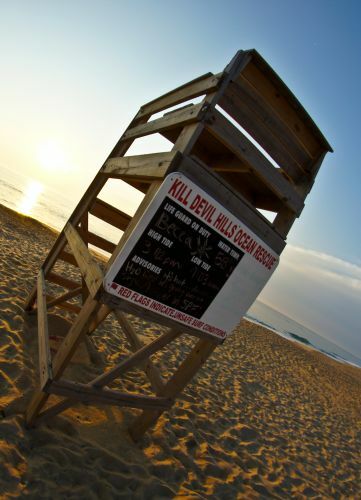 The Kill Devil Hills movie theater is a perfect retreat for sunburned vacationers to cool off! A fun outing for adults includes taking a laid-back, "snob free" wine tasting class at the Outer Banks Wine University . Wright Brothers National Memorial . This is the site of Orville and Wilbur Wright's historic first flight on December 17, 1903. The National Park Service Facilities include a visitor center displaying a replica of the Wright Flyer, the granite Wright monument atop Kill Devil Hill and a reconstruction of the Wright's 1903 camp. Avalon Fishing Pier . Located at Mile Post 6 on the Beach Road. Fishing from the pier is a tradition for many vacationers and it is so much fun for kids! You can rent tackle and the shop sells a variety of bait and supplies. Nags Head Woods Ecological Preserve The entrance to the preserve is located in Kill Devil Hills on Ocean Acres Drive. This large expanse of rare maritime forest boasts a wealth of biological diversity. Owned and operated by the Nature conservancy, a visitors center and education programs are offered. Outer Banks Daredevils Baseball . The local team is part of the hottest summer collegiate baseball league. Come see players before they become big national stars! This is a fun, family-friendly activity that is as American as apple pie.